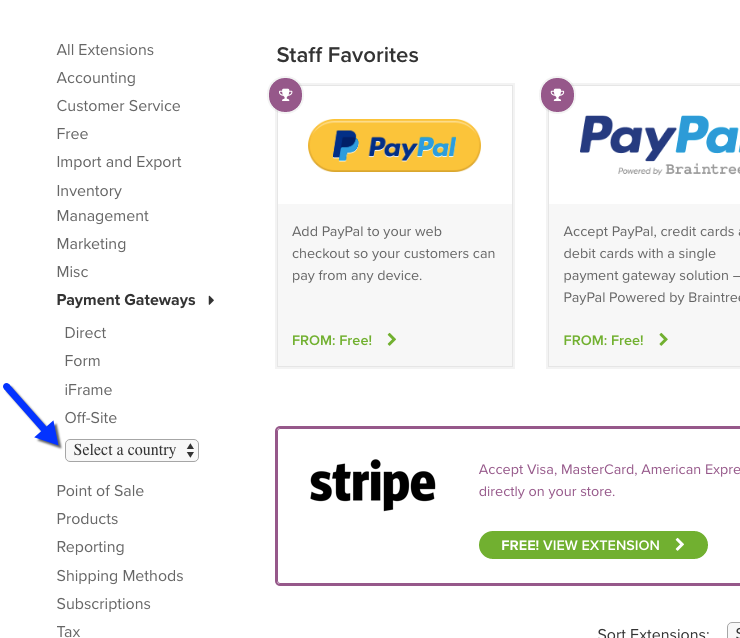 There are dozens of Payment Gateway options for WooCommerce. A payment gateway in WooCommerce terms is a WordPress plugin for WooCommerce that allows customers to pay for goods and services using a payment system such as PayPal or Stripe. All require an account with the Payment Gateway company. Each has terms and fees set by the Payment Gateway company, which is separate from the WooCommerce extension subscription. Contact the Payment Gateway company directly, with questions about account requirements, terms and fees. Some have multiple options based on different account types, transaction types or redirect methods, such as PayPal and Authorize.net. Comparison charts for PayPal, CyberSource and Authorize.net. 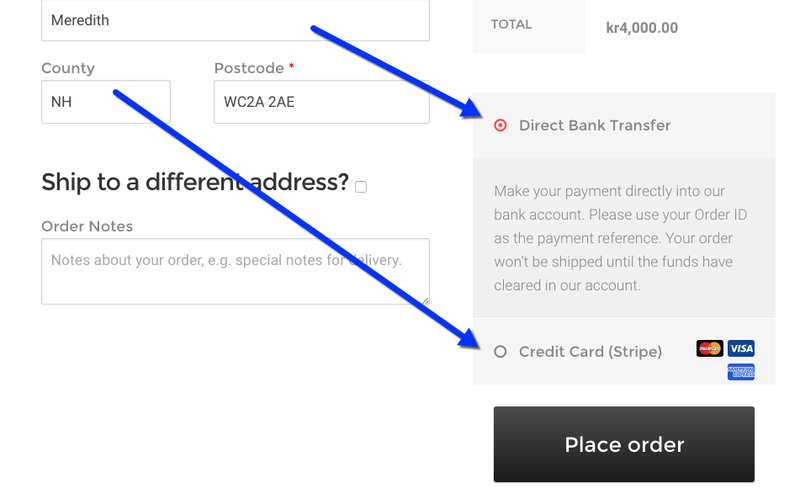 Redirect: Customer is forwarded to the Payment Gateway site to process payment, then redirected back to your site to complete checkout. Direct: Customer purchases and pays directly on your site, requiring an SSL certificate as part of PCI Compliance. If you’d like to read more about payment gateway security, check out our WooCommerce site and data security FAQ. Shop location and currency are factors. A payment gateway company/processor may only serve merchants based in certain countries. If it only supports U.S. dollars and accepts U.S. shop owners, shop owners in Canada and Europe cannot use it. However, customers from all over the world can use the gateway to check out and pay. More info at: What to Consider about Payments when Selling Internationally. Shop owners accepting payments have a responsibility to protect sensitive customer information, such as email addresses, shipping addresses and billing information. To do this, most payment gateways require an SSL certificate. This encrypts communications between your site and customers, and your site and the payment processor. More info at: SSL FAQ. Other steps to secure your site are covered by the Payment Card Industry Data Security Standard (PCI-DSS), which apply to anyone storing, processing or transmitting credit card data. More info at: PCI-DSS compliance and WooCommerce. Should you wish to sell Subscriptions (separate purchase), you must choose a payment gateway that supports manual or automatic recurring payments. More info at: Subscription payment methods and gateways. You need at least one payment method to collect payment on your site. One: Only having one way for customers to pay is a risk, as payment gateways can encounter down time or another unforeseen issue. Two: Offering different payment options increases the possibility that customers can always check out and complete payment. Too many payment gateways can overwhelm customers with choice and make your site administration more complex. Choose according to shop requirements and business needs. Our WooCommerce plugin gives you several free payment options to use, called Core Payment Options. Should you wish to use something different, you can select and purchase a Premium gateway. Payment gateways and options included in WooCommerce for *free are listed at: Core Payment Options. *PayPal and Stripe charge fees and require you to set up an account. WooCommerce.com charges you nothing. 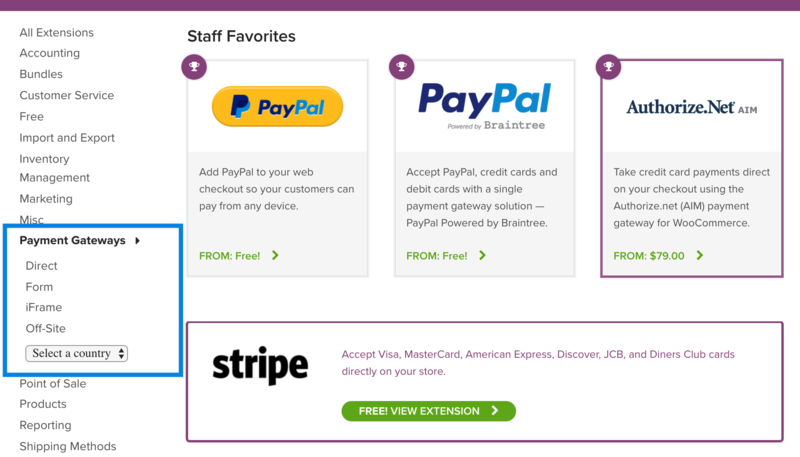 Paid payment options available: Premium Payment Gateway extensions. In the left sidebar, search by Direct, form, iFrame, Offsite (Indirect) or Country. If selling to customers in Europe, the European General Data Protection Regulation (GDPR) framework should be part of your decision on which payment gateway to choose. For more information on the GDPR and its concerns for user privacy, see: WooCommerce and the GDPR. Customer information collected during checkout depends on the payment gateway. If you’re working with a manual payment gateway such as BACS, your site won’t process the payment itself, since you will check your bank account, independently of your site. Other payment gateways, such as Stripe or PayPal, require information to be passed from your site to that payment processor. It’s up to you to choose a reliable processor, as well as consider the impact on customer data. Any payment gateway you choose should have information about how to handle customer data. Check the payment processor’s website to learn more about their privacy policies and GDPR. For more information on how payment gateways apply GDPR, see: Privacy Considerations when Using Official Payments Extensions.